Saturday was a good day, and it started off on the right foot. I woke up in my own bed at mine and Victoria’s place in Madison. I hadn’t been to our apartment since May 11th, and it was nice being home for a change. We met up with Alex and Jess for lunch. They were my hosts in Chicago when the Brewers played the Cubs in April. 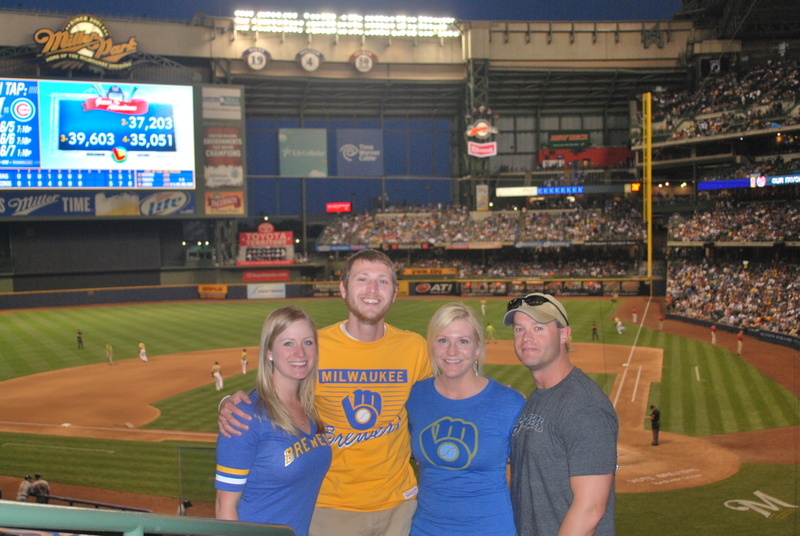 They will be my hosts again later this month when the Crew take on the White Sox, and again at the end of August for the last Brewers-Cubs series of the season. We ate at the Great Dane at the Hilldale Mall, and I kind of surprised Alex and Jess because they didn’t know that I was going to be joining Victoria. 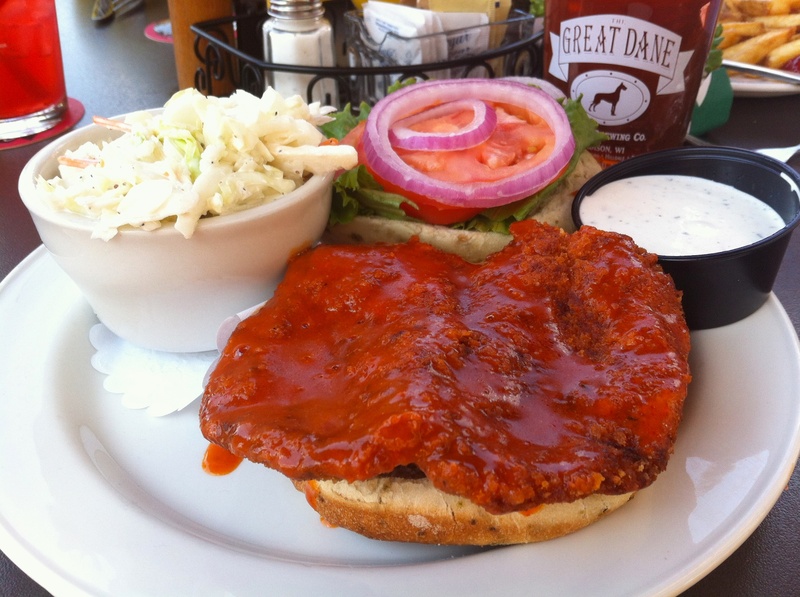 I had the Buffalo chicken sandwich, and it may have been a little too spicy for me. I like spicy food, but when it starts taking over all the other flavors, it becomes a bit much. The menu says it’s a “five-ounce breaded chicken breast crisp-fried and tossed in our 3-alarm wing sauce. Served on a Jalapeño roll with lettuce, tomato, Bermuda onions.” It also said it came with Gorgonzola on the side, but I asked for ranch. I don’t know why they give you a whole mini cup full of ranch, I probably used 1/30th of what they gave me. Unless you drink it I don’t know how you would use all of it on your sandwich. We met for lunch at 1:00, were there for an hour and 45 minutes, then Victoria and I left for Milwaukee. We were parked by around 4:25 pm, and I spent the next 45 minutes informing tailgaters what I’m doing this year and why. There were a couple of groups of people in their twenties that were somewhat stationary, which makes it easier to tell them all at once. I don’t even bother with groups that are playing bags, because they’d have to stop their game and come together, and I don’t want to be an annoyance to people. If a group is sitting around and just talking then I don’t see a problem with starting conversation. I got inside around 5:10, and I met Victoria behind home plate. We headed to the left field corner of the loge level for game photo number 53. Victoria probably took 10 or so pictures before I deemed one of them suitable. I’m not as particular when a stranger is taking a picture, but if it’s someone I know I won’t hesitate for a do-over. I like the new system I have in place for the home game pictures, and I’m upset that it took me almost 20 games to figure it out. At least the entire loge level bowl view progression will be uniform. After the picture was out of the way Victoria and I went and saw the Ice Man (who I got a picture with yesterday), and then down to say hi to Bill. We got to our seats with plenty of time to spare. 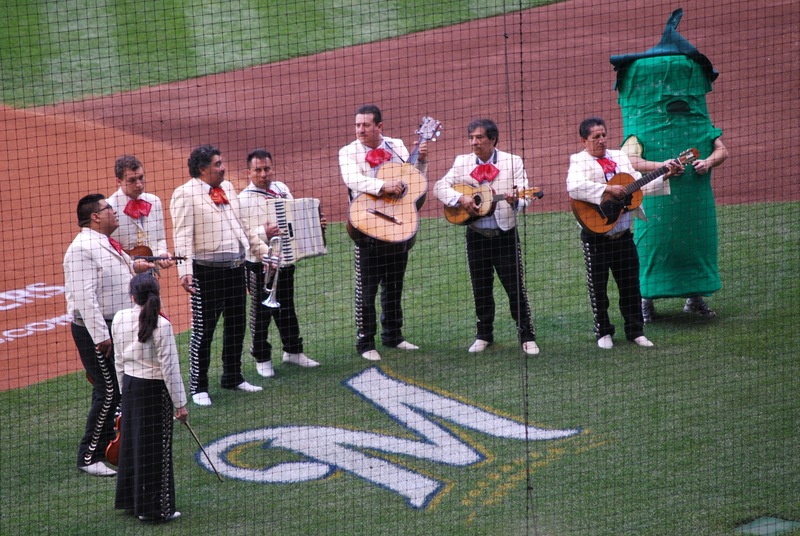 Since it was Cerveceros (spanish for Brewers) day at the ballpark there was a mariachi band down on the field. Check out the Jalapeño there on the right, or at least I think it’s supposed to be a Jalapeño. In an earlier post I had mentioned that the most junior member of a bullpen typically brings out their sunflower seeds, gum, and other goodies in an embarrassing backpack or suitcase. 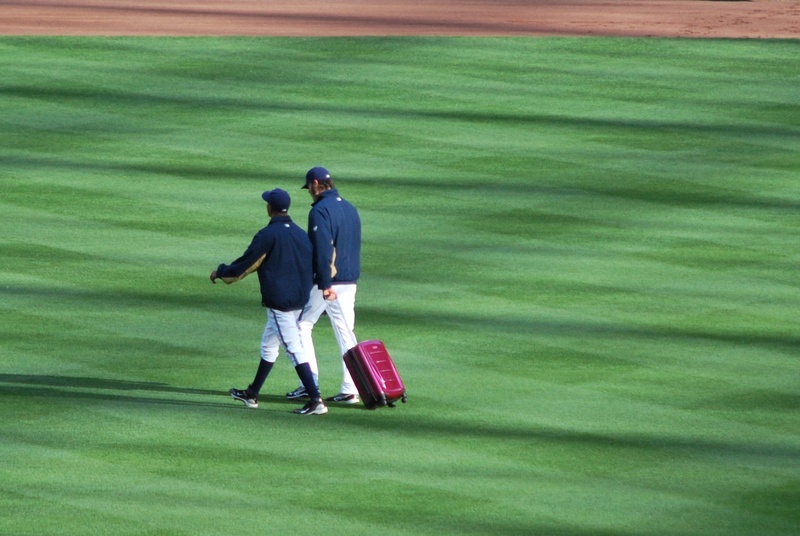 I was able to get a better picture of Tim Dillard rolling the purple/pink suitcase out towards the bullpen before first pitch. Dillard has pitched more MLB innings than Juan Perez, but he’s five years younger, so I’m guessing that’s why Dillard gets the job. My sister Becca and her fiancé Lee joined us at the game, and I had bought the two seats next to mine earlier in the week. Becca and Lee didn’t come down to the seats until the top of the second, and they didn’t miss anything. In the bottom of the second the Brewers got on the board, when Brooks Conrad hit a sacrifice fly to left. 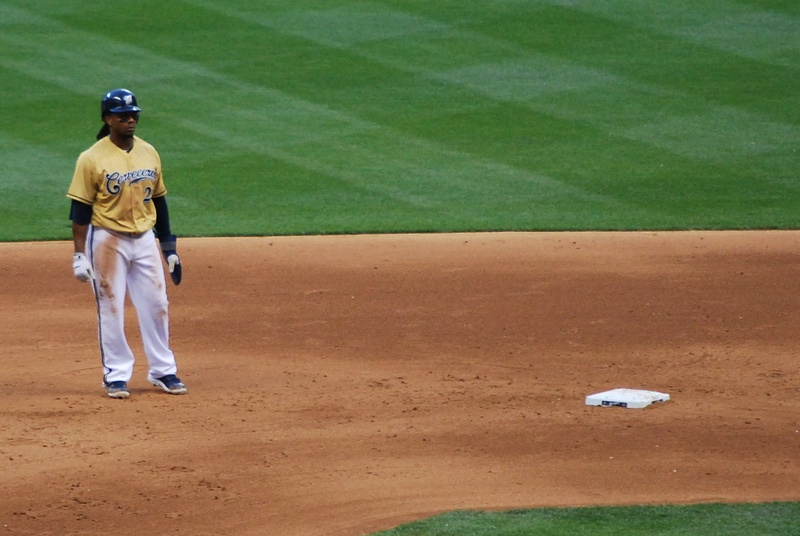 The bases had been loaded with nobody out, so the Pirates limiting the Brewers to only one run was somewhat of a disappointment. The Pirates tied the game at one with a solo (monster) home run off the bat of Garrett Jones in the top of the fourth. The outfielders didn’t even budge because they knew it was long gone, it went an estimated 451 feet. The Brewers came right back and took the lead for good with four runs in their half of the fourth. A two run single from Ransom and a two run home run from Brooks Conrad wrapped up the scoring. 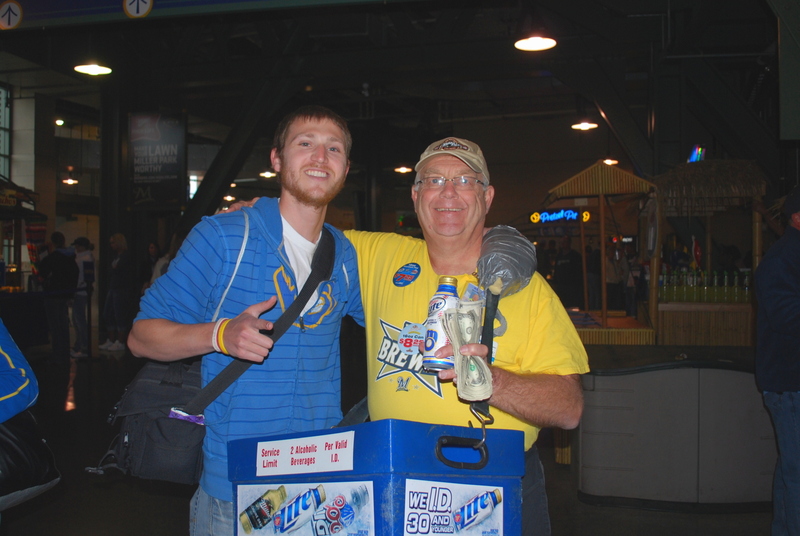 It was Brooks Conrad’s first hit as a Brewer, and it came in his 28th at bat with the Crew. He had been raking in the minors, so it was nice to see him finally get a hit (I’m sure he was relieved as well). 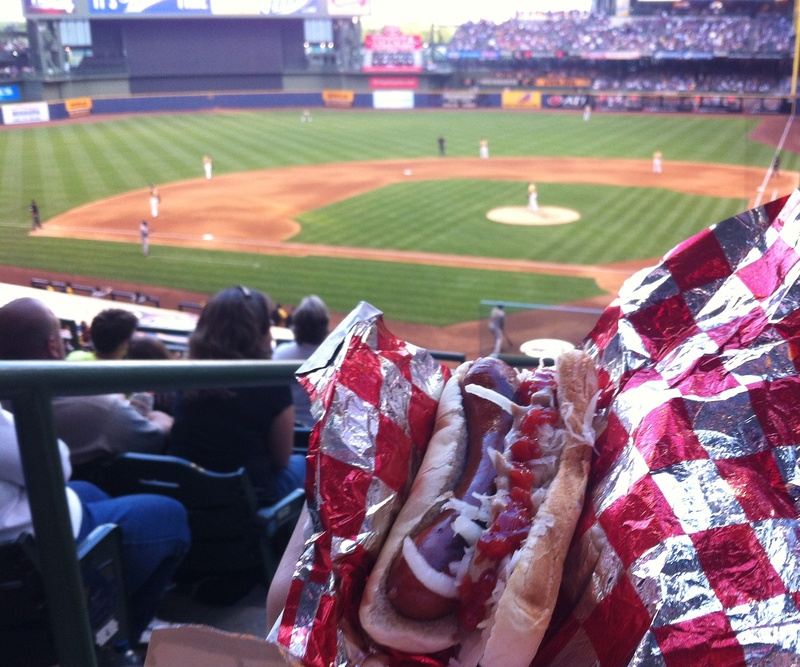 Final Score: Brewers 5 – Pirates 1. 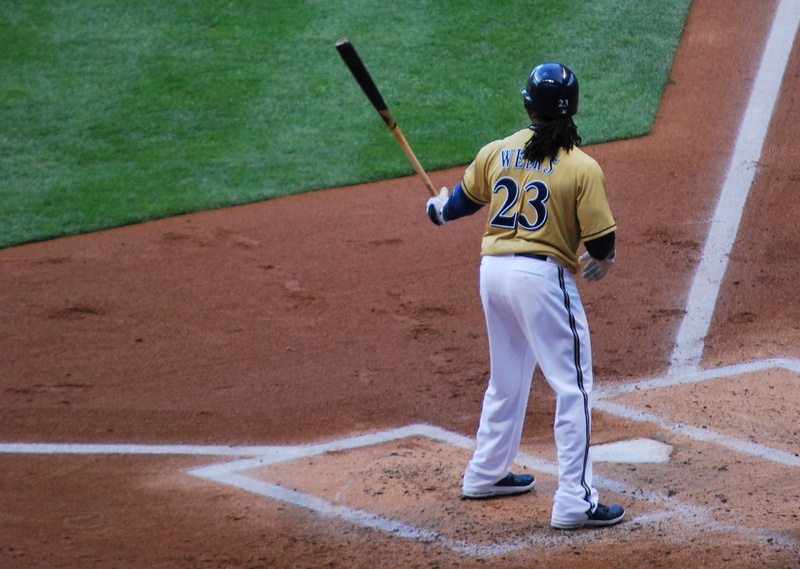 Rickie Weeks had a great game, going two for two with two walks, two stolen bases, and a run scored. He wasn’t retired in the game, and if he can get it going the Brewers should be at least able to tread water until Lucroy returns. Two pictures of Weeks are below, one while he’s at the plate, the other while at second after a steal. Notice the gold jerseys, and Cerveceros on the front. 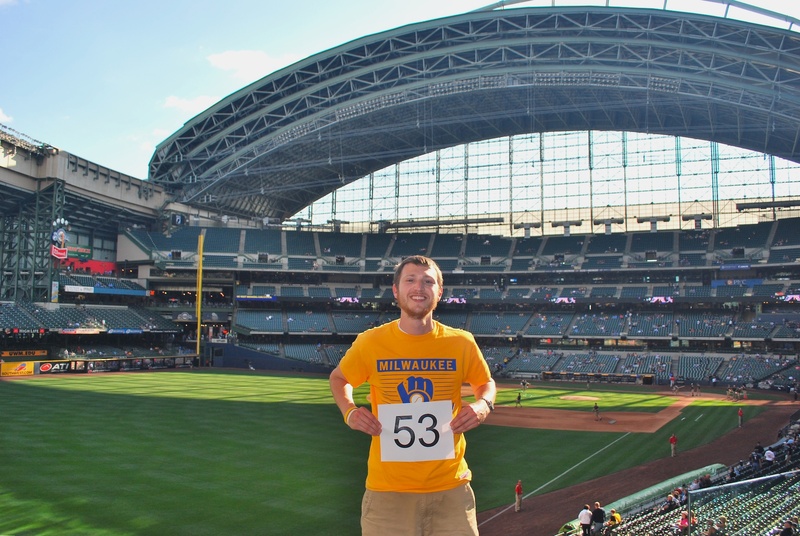 The Brewers have worn Cerveceros jerseys since the first Cerveceros day back in 2006, but just last year they started wearing the gold jerseys. Late in the game I had a fan a couple rows in front of us take a picture with the field in the background. Left to right it’s Victoria, myself, Becca (my sister), and Lee (Becca’s fiancé). Becca and Lee are getting married in Las Vegas on October 4th, and Becca is quietly rooting against the Brewers to not make the playoffs. October 4th is the day after the last day of the regular season. If there is a rainout and a game has to get made up (even if it’s for another team’s playoff chances, the game would be played October 4th). We’ll see how everything goes, the fact that the season ends with 39 games in 41 days isn’t doing me any favors. I’m writing this from Victoria’s Aunt and Uncle’s kitchen table in Sussex, and we’ll be leaving for Sunday’s game in a little over an hour. The rubber match with the Pirates is today. Hopefully Mike Fiers can duplicate his performance from five days ago, when he limited the Dodgers to one run over seven innings.